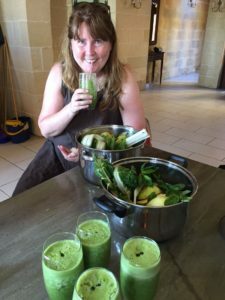 Spring is a great time for a detox, and our organic juice and raw food programme will jump you into a higher state of wellbeing, combined with some lifestyle changes that can help change the quality of your life …. for good! We also offer a variety of healing and relaxation techniques, including yoga and meditation, quantum energy Tachyon tools, colour light therapy, counselling, and Power of Eight circles. Also available as options this time will be wonderful Lomi Lomi massage, and the powerful Assemblage Point therapy. “It sounds melodramatic but this retreat was definitely a life changing experience for me. I joined a group of wonderful people in May on the stunning island of Gozo. After a week of juicing I went on to participate in a 90-day detox programme and have been losing weight every week. I have now lost a total of 4 stones (in 8 months) and the weight keeps dropping. I have noticed a dramatic change in my energy levels and my vibration has sky rocketed upwards. Check it out here and book now for £50 off!